WotC is working on the math of the game to ensure a solid foundation. The focus to achieve balance is shifting from the encounter (4E’s innovation) to the adventuring day (of previous editions). The adventuring day is defined by a number of rounds of combat with a certain number of enemies. Hit Points are the tracking mechanism. DMs will be crystal clear on target rounds/day expected. If a DM chooses to go under that target, casters are stronger because they don’t run out of spells. If the DM goes over the target, the non-casters are stronger because they don’t expend resources (or not as often). Number of foes also matter, because many spells are AoE, and the wizard won’t use fireball at all (presumably expected as part of the game’s math/balance) if all the fights are with one foe. All the options are managed by the DM. Idea is that the 5-minute day can be ‘cured’ by the DM monitoring these factors. Now that I’ve given myself a chance to figure out what it is saying, let’s quickly discuss the problem and come back around to what is being proposed. There are arguably two problems, or at least two extents of the problem. The classic definition of the Five Minute Workday is that of optimization. The party enters the dungeon and in the first fight the wizard casts fireball, the player’s favorite spell. The fighter takes a few hits, and the cleric spends some healing spells. The rogue spends half the combat hiding and doesn’t expend any resources. The wizard’s player says, “I used my best spell, why don’t we rest?” and the other players blink. What follows is some discussion. The rogue wants to keep going, feeling he barely had a taste of combat. The cleric can see the wizard’s point, as those healing spells can be pretty important if the party faces a harder fight. The fighter is in between, a bit worried about what the cleric is saying but still feeling hardy. Stop for a second and meta-game. The wizard is right. In most classic adventures, the party should rest and come back. It is the safest path to victory. There is a story reason, such as a limited time-frame to save the captives, stop the ritual, etc. The DM has established often that he or she will have wandering monsters happen to come by if the party abuses resting. Less classic but still very important is when the party is truly out of resources. Here is an actual example from a game of mine in 1991. The brave heroes have just come back from their first foray into the Temple of Elemental Evil. I’ve prepared a few events back in the town of Hommlet. A number of fun interactions ensue, establishing nice relationships with NPCs before the PCs go back to the temple. Our next gaming session starts as they enter the temple. I’ve prepped a lot of this level of the temple and I’m excited to see how they handle the various threats! Except… they get unexpectedly clobbered in the first room they enter. It is nearly a TPK and they are extremely low on hit points, very low on spells, and all out of healing. What do I do? I haven’t prepped for a return to Hommlet, plus the narrative really doesn’t call for more interactions with NPCs… it would overdo that angle. And I don’t want to hand-waive the resting… I want my Temple to be dynamic, where other monsters compensate… but if I restock the dungeon when they return we might never finish. Argh! Simply stated, the second variety of the Five Minute Workday is one where the party can run out of resources faster than expected. When that happens, it becomes obvious folly to continue. Even if the PCs want to save the prince or stop the evil cult, it becomes a suicide mission to do so (awesome every now and then, not great every second session or when just exploring). Let’s examine this further, though. Why is resting a problem? The answer is important: the balance of the game assumes you don’t rest too often. If you rest before each combat, you are far too strong. This is especially true in a classic D&D model. Temple of Elemental Evil is full of rooms with just a few foes. If the party stops every time due to optimization, the adventure will be too easy (and boring). If the party stops frequently due to running out of resources, the game is too erratic – the PCs never know whether they are facing death traps or just two goblins… frankly, that is an issue in many classic adventures. Do PCs still have something cool to do each fight? Do PCs have sufficient healing to reach the next fight, and perhaps to heal in the next fight? In previous editions, Vancian magic was equated with the Five Minute Workday because it also came with the idea of gaining spells of different levels. When you cast your most powerful spells and had little to do in the next fight (“the only thing I have left is Shocking Grasp and Levitate”) you want to rest. Healing in 3E was such that the cleric often needed to heal every round. Running out of healing likely meant a TPK (or running around with a wand of cure light wounds trying to get PCs back up and barely avoid that TPK). Each game and edition handles things differently. Some RPGs never assume dungeon crawls, and are based around 1-2 fights in a day. For example, in Shadowrun or Legend of the Five Rings, adventures seldom see more than three fights in a day. The problem largely doesn’t exist. Or, the game has a system such that PCs can be fairly strong in each combat. 4E’s encounter and at-will power system was based around this, with hit points and surges set for 3-4 fights a day. Players in 4E knew that and responded accordingly. DMs could make thinks harder or easier to extend or contract the number of fights. Party will explore the goblin area of a dungeon, engaging them in 10 rooms filled with a few goblins at a time. 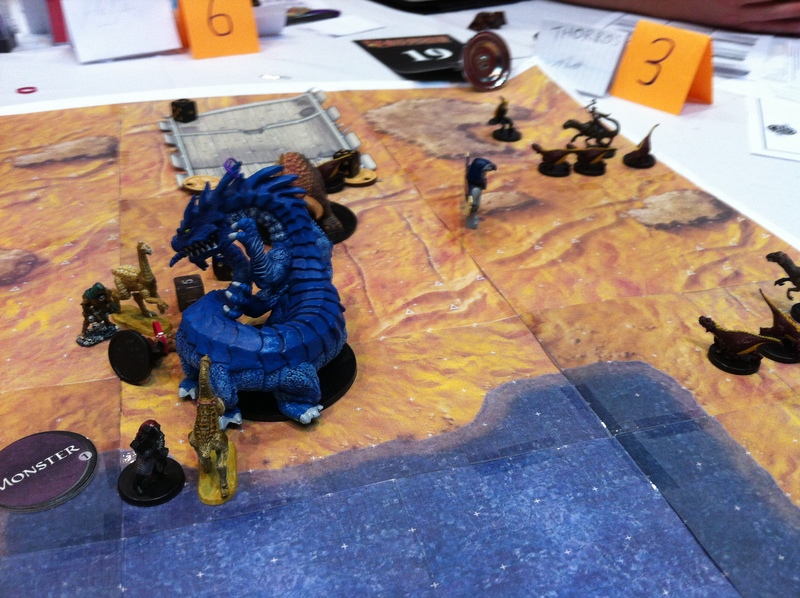 Party is traversing the wilderness and will face off against a few singular foes in their lair, such as an ogre and later an otyugh. Party will face one single large mob of foes, such as an attack on a town. Party fights several easy thugs, enters their home and fights a few thugs and lieutenant, reaches the final room to fight the powerful boss. Ideally, D&D lets us do all of those scenarios without triggering the Five Minute Workday. Shifting from an encounter to an adventuring day sounds fine, but 4E largely avoided the 5-min day by having Encounter powers. These powers gave you a limited number of strong moves to supplement the Vancian system of daily spells. And, At-Will powers further kept things interesting and effective. A daily focus can work, but it isn’t clear how this will be achieved with Next. Of paramount importance is what happens when 1-2 PCs are low on HPs, what happens when the wizard casts his or her two strongest spells, and how the party can handle another combat if the cleric has used up all their low-level (usually important) healing. A target on rounds/day is perhaps okay, but it isn’t clear whether the system will be less swingy than it has been. If a couple of kobolds can drop the cleric in the first encounter of the day, and the party has no healing beyond the cleric… well, welcome to the 1-minute adventuring day! Casters vs non-casters shouldn’t feel boring and the same (an argument often made regarding 4E’s balance using powers), but they shouldn’t be in a huge tug of war (what Next seems to suggest). It isn’t great to have the fighter shine only once the wizard has run out of spells. That creates a really bad bar graph of fun for each PC, starting with casters on “fun” and non-casters on “not fun”. It should be possible to solve this mechanically through balance, not with DMs having to shoulder the responsibility or adjust the adventure on the fly (“oops, wizard hasn’t cast spells… let me change this next fight to have more foes so she can cast fireball”). Worse, being a D&D Next DM shouldn’t require deep expertise. Already with D&D Next I feel like the monsters lack balance and I’m developing necessary expertise. I am learning the difference between 4 goblins, 10 goblins, 1 medusa, and so on… but the game should do that for me so a new DM can have fun rather than frustration with their first game. D&D 4E has drawbacks, for sure, but it is the edition where a player could transition to being a DM most easily. An encounter for level 1 PCs was 5 level 1 monsters, or look up the XP total and add monsters. Best of all, as you became an expert you learned how to fine tune that, but it worked out of the box. I’m perfectly happy to see D&D Next change the model to support shorter combats, dungeon crawls, longer days, and the like. However, of paramount importance is having the basic balance of the game to be easy on new and casual DMs. The game should have good balance such that a DM’s expectations will usually bear true. This allows DMs to know how long the adventuring day will likely be and avoid surprises that reduce fun. Player’s rest when PCs run out of fun things to do or when they fear the next combat will be too risky. Vancian magic is great, but mixing in some of what other editions and RPGs have learned will keep interest high. A swingy system, where there is very little predictability as to a combat’s lethality, will be more likely to cause a short adventuring day. Casters and non-casters should be equally fun to play, regardless of the length of the adventuring day. Mechanics should balance casters and non-casters, without forcing DMs to change an adventure, adjust the number of foes in a room, or artificially shorten or extend the adventuring day. The game should be approachable: fun from the start for a new DM. Expertise should add minor refinements and not be required. Awesome is already baked into a Dark Sun 4E Fight! This entry was posted on October 17, 2015 by Alphastream and tagged 4E, 5E, Challenge Level, Pace, Playtesting, RPG History.